Meghann has been dancing since she was nine years old. Finding a love and an outlet in this art form she pursued dance as a career after attending Oklahoma City University and graduating in 2006 with a BFA in Dance Performance. After college, Meghann lived in L.A. for a few years taking classes, auditioning and learning all she could about her craft. While in L.A. she was able to perform for the House of Dolls Fashion Show choreographed by Michael Bailey (2006) and was also featured in a VH1 spot with Perez Hilton(2007). After auditioning for Celebrity Cruise Lines in 2008 she joined the company and spent the next seven years (2008-2015) performing and traveling the world. This is where Meghann was approached to train in the aerial arts and her flying career began. After attending and successfully completing a strenuous boot camp she was privileged to perform her first static trapeze act with three other amazing aerial boot camp survivors. 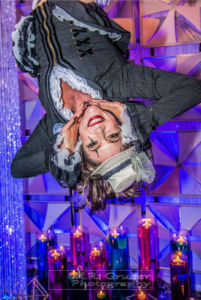 This started a five-year aerial career where Meghann was able to learn and perform shows that highlighted a variety of dance and aerial styles including: duo and quad static trapeze, spanish web, bungee, dance trapeze, adage/statue, and of course, lyra. Since retiring from ‘ship life’ in 2015, Meghann has had the opportunity to perform in Pennsylvania with a focus on lyra routines. Meghann is ecstatic to get back in the air and bring her knowledge to Studio Spin. See you soon! From where to you draw inspiration? Everywhere I can! Music and my mood inspire me greatly. I also love to observe. People and animals all have their own body language and interactions that intrigue me and inspire new movement. I love the adrenaline that comes with flying, the confidence performing gives oneself and pushing of boundaries. These elements bring me peace of mind body and spirit and I see it flow through each student and performer as they work hard and accomplishing new and sometimes ‘impossible’ goals. How do you like to motivate your students? With encouragement and personal energy. By ‘personal energy’ I mean that I try to feel out a student’s personality and learning style, then I try to dissect what might work for them. I am also highly motivated by the energy of the students and the class. Do you have a funny quirk or distinguished personality trait? Expressive hand/body language and sound effects. The body language is part of my explanation process/everyday life and the sound effects come out sporadically when I can’t find the words necessary or when I get excited. What do you love most about teaching your students? Seeing the light bulb click on, on a new trick or transition. And the changes in body and personality as they gain confidence. What kind of music is typically on your playlist? Music that makes you want to dance or moves you and your body! Anything including but not limited to Feist, Flogging Molly, Marc Anthony, Drake and Nicki, Disco, Tango, Salsa, Dubstep, 80’s, 90’s, Hip Hop, anything with amazing percussion, the list doesn’t really end. Wine. I am a bartender as well and would love to become Sommelier-certified one day in the near future. Bougie! I LOVE Barcelona, Santorini and Mykonos, Argentina (Buenos Aires Mendoza regions), Capri…..I’m not done finding new places yet either! Marissa Tomai, Any of the Golden Girls! Currently, ‘Take your pleasures seriously’, ‘Don’t let ANYONE tell you, “You can’t”.